Not all families look alike -- so why should all toys? That's the question that led Ez Karpf to build a new kind of toy company, MyFamilyBuilders. 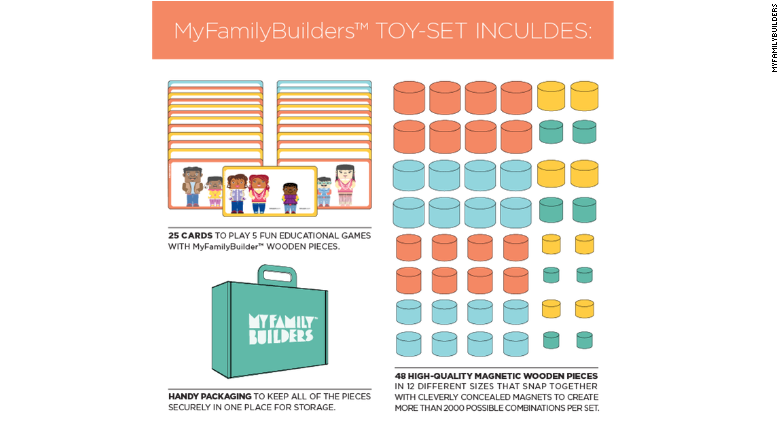 MyFamilyBuilders is a kit that includes 48 wooden pieces -- including heads, torsos and feet -- that snap together to form 2,000 combinations of families. 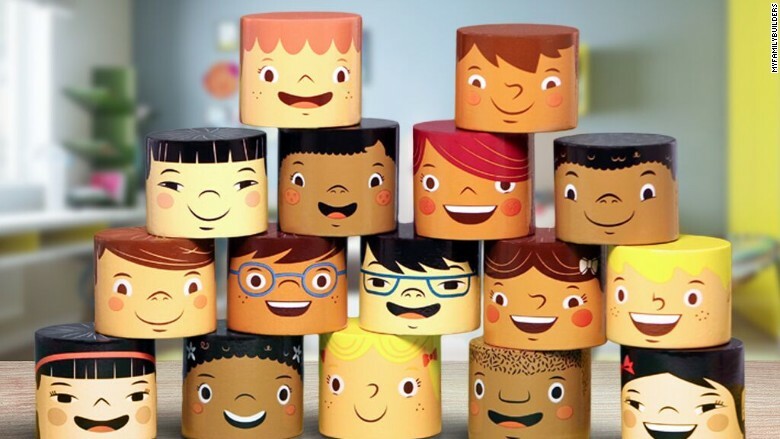 With diversity and inclusion top of mind, the kit allows children to build a family that looks like theirs and encourages them to think about other family makeups. The idea for MyFamilyBuilders stemmed from Karpf's own frustration with cookie-cutter toys. He wanted to buy a toy for his friends' five-year-old daughter -- one that resembled the girl's own multi-racial family. "I assumed you'd find toys for all sorts of families," he said. "90% of the time, you find a family in a toy set that is one mom, one dad, one girl, one boy. Sometimes there is an African American box or Asian box." Try to find a box with two moms, or two dads, or blended families and it's basically impossible. "Don't even think about mixing them because oh my god, the world would end," jokes Karpf, who is from Argentina but lives in San Francisco. Karpf, who has a background in industrial design and code development, has been developing the product for the past year. He has five business partners, including a child psychologist and education specialist, all of whom work on MyFamilyBuilders part time. On Tuesday, Karpf and team launched a Kickstarter campaign, with a goal of raising $25,000. The set -- which is developed for kids ages 3 to 7 -- ranges from $52 to $75 depending on how early backers support it. It will retail for $110. The kits also includes 25 cards with educational games to help parents educate young children about the different types of families. The cards are meant to be conversation starters for parents and their children. "Sometimes its extremely hard to speak about race because [parents] don't know how to bring it up -- they think its better not to talk about it," he said. Karpf said some parents fall into the trap of teaching kids that "we are all colorblind, we are all the same." "Kids know we all aren't the same. We are different in many aspects," he said. That's another reason why not all of the wooden blocks are the same size -- kids can build characters that are taller or shorter, chubbier or thinner. The toys will not only be sold directly to consumers, but Karpf said they'll partner with psychologists and education specialist to use the toys in their practices. "Diversity and differences are something to celebrate, not be afraid of," added Karpf.